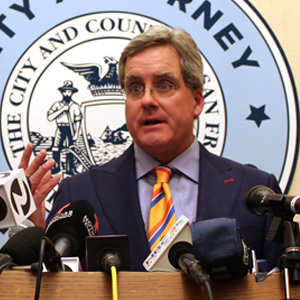 City Attorney Dennis Herrera at a press conference on Apr. 25, 2017 after a federal district court ruling put a nationwide halt to enforcement of President Donald Trump’s executive order on sanctuary cities. SAN FRANCISCO (Apr. 25, 2017) — City Attorney Dennis Herrera today issued the following statement after a federal district court ruling put a nationwide halt to enforcement of President Donald Trump’s executive order that threatened to strip sanctuary cities of federal funding. “Faced with the law, the Trump administration was forced to back down. This is why we have courts – to halt the overreach of a president and an attorney general who either don’t understand the Constitution or chose to ignore it. This is why San Francisco had to stand up on behalf of people everywhere, be they immigrants or native born. As Americans, we all have a duty to confront injustice, even when it emanates from the White House. The court found the Trump administration’s arguments were not legally plausible, and the court sided with us on every substantive issue. San Francisco was the first city in the country to sue President Trump over his executive order on sanctuary cities. Santa Clara County later filed a similar lawsuit. Both sought a preliminary injunction in U.S. District Court for the Northern District of California. Today’s ruling covered both cases.